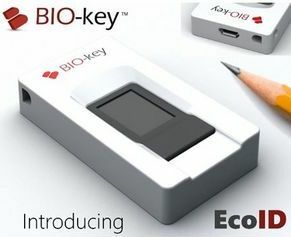 WASHINGTON, DC--(Marketwired - Mar 23, 2015) - BIO-key International, Inc. (OTCQB: BKYI), a leader in fingerprint biometric software technologies for secure on-device, in-cloud or mobile device credentialing and identity verification solutions, will introduce EcoID, a compact USB touch fingerprint reader, at the connect:ID convention March 23rd - 25th at the Walter E Washington Convention Center, Washington, D.C. (Booth #204). EcoID is a compact USB touch fingerprint reader pairing the Active Thermal™ sensor from NEXT Biometrics with the superior accuracy of BIO-key's biometric algorithms and software, to deliver top quality at an unprecedented price point. EcoID delivers one-touch identification and strong authentication for existing BIO-key customers, as well as any entity seeking to add low-cost, high performance fingerprint authentication to their existing Windows or Android devices, supporting both Microsoft Windows Biometric Framework (WBF) and upcoming FIDO support. The sleek, low profile form factor is highly portable, fitting easily into a purse or pocket, and features a lanyard/security cable pass-through for secure commercial applications. EcoID aims to disrupt the touch fingerprint reader market with an MSRP of $34.99, substantially below other USB touch scanners. EcoID is available immediately, direct from BIO-key and through select distribution partners. Microsoft has incorporated enhanced integrated fingerprint biometric security features in Windows 10 with their Microsoft Hello™ and Passport solutions. EcoID enables users to leverage this capability in workstations that currently lack them. EcoID joins BIO-key's SideSwipe™ tablet and laptop-ready scanner as an outstanding low cost option for adding fingerprint security to workstation or mobile devices and is plug-and-play ready for WBF as well as Android. "BIO-key recognized that our banking, retail, and consumer-facing customers struggled to source a low-cost, high quality fingerprint scanner to pair with our biometric identity assurance platform," says Jim Sullivan, BIO-key Vice President of Strategy and Business Development. "Recent acquisitions of fingerprint scanner manufacturers by Apple, Synaptics, Qualcomm and HID has created a void of quality, reasonably priced USB touch scanners. In collaboration with NEXT Biometrics, we developed a great scanner with unlimited applications at a terrific price. We think this lower cost solution could provide an ROI tipping point for accelerated adoption of biometrics versus other strong authentication options." "NEXT is delighted to provide a key component of this exciting new BIO-key device," says NEXT Biometrics CEO Tore Etholm-Idsøe. "BIO-key has a history of providing transformational software capabilities to the commercial identity marketplace, and they have set a high standard for large scale commercial biometric use, in terms of one-to-many search, accuracy and device flexibility. Their innovation and customer orientation have enabled another solution breakthrough with EcoID. We are very pleased they chose NEXT to help them achieve this ambitious price-performance target."